A major emergency wildland fire training exercise held across areas of Antrim, Fermanagh and Down this weekend [9 Mar] was the largest in Northern Ireland history. 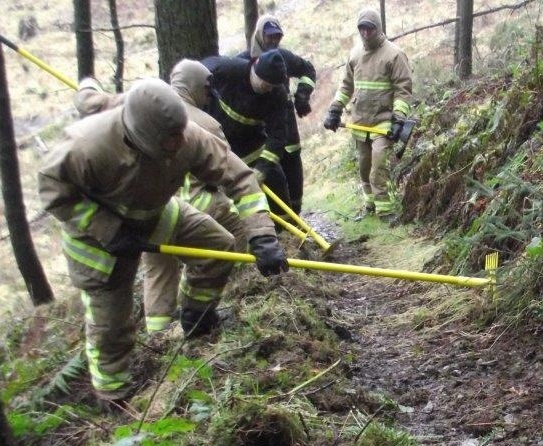 The training exercise, known as “Exercise Forest Flame” was designed to fully test Northern Ireland Fire & Rescue Service (NIFRS) operational response, procedures and resilience, as well as the ability of multi-agencies to integrate and respond to a major uncontrolled wildfire incident across a large geographical area. Exercise Forest Flame involved over 210 people from a wide range of agencies and simulated spate conditions when major wildfire fires and multiple smaller wildfires occurred simultaneously across Co. Antrim, Fermanagh and Down, over a protracted period of time. CFO Chris Kerr said: “Tackling gorse and wildland fires present extreme challenges for us as an emergency service. "It means deploying Firefighters and their equipment, to usually quite remote locations, often for prolonged period of times, working under hazardous and intense heat to bring these fires under control. During the May bank holiday of 2011, NIFRS received a call every 45 seconds – the busiest period in history. Given the likelihood that Northern Ireland will undergo another period of spate wildfire conditions CFO Kerr believes this was an "essential training initiative for our Firefighters and partnership agencies and will ensure we continue to build upon this type of operational response experience". He added: “There have been learning points for all of the agencies involved following this exercise. "This will ultimately enhance interagency working between the emergency responders and enhance our capability in protecting our community. I want to reassure the public, that their fire and rescue service is well rehearsed and well prepared to protect our community during spate wildfire incidents."